Handloom woven multipurpose mat for Everyone.Best travel mat for taking along anywhere.It can easily be opened and folded back to a travel-friendly and storage-friendly cotton bag.Made by traditional handloom weavers based in Kavundapadi village, Erode district, tamil nadu.Made of banana plant stem strips and cotton yarn and woven in handlooms. Banana plant stem, an agricultural waste which would otherwise be a landwill, is coverted into beautiful home linen that is durable, environment friendly and 100% bio degradable. Through design intervetion, new product developments and continuous orders,sustainable livelihood is provided to the weavers. 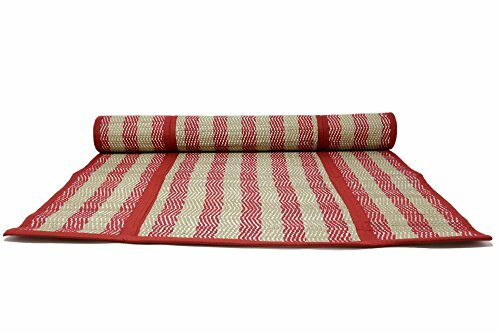 Multipurpose Travel Mat for Beach Meditation Yoga Exercise Picnic Home Outdoors AND Ideal for casual dining, outdoor dining and occasions. Free of any chemicals, plastics or synthetic agents. Produced in a fair trade environment - with fair wages to artisans and hygenic working condtions.Not mass produced,made with love and care while preserving handloom weaving traditions. WASHING INSTRUCTION-These are handwashable and in case of stains - can be spot cleaned with a soft brush and mild detergent solution. Air dry.Do not store damp/wet table linen in closed spaces ( Dry them thoroughly before locking them in a wardrobe or cup board). Note: Color discrepancies may occur between this product and your computer screen.Size-26x72 inch,Weight-905 grams. Eco friendly Natural Banana Fiber Multipurpose Folding mat WITH travel-friendly and storage-friendly COTTON BAG. Multipurpose Travel Mat for Beach,Meditation,Yoga,Exercise,Picnic,Home,Outdoors AND Ideal for casual dining, outdoor dining or any occasions.